With best-in-class dig depth (11 ft. 6 in. [3.5 m]) and reach (18 ft. 6 in. [5.6 m]), the EZ36 is highly productive and offers the performance of a conventional track loader with excellent maneuverability and stability on a minimal swing machine, according to the manufacturer. 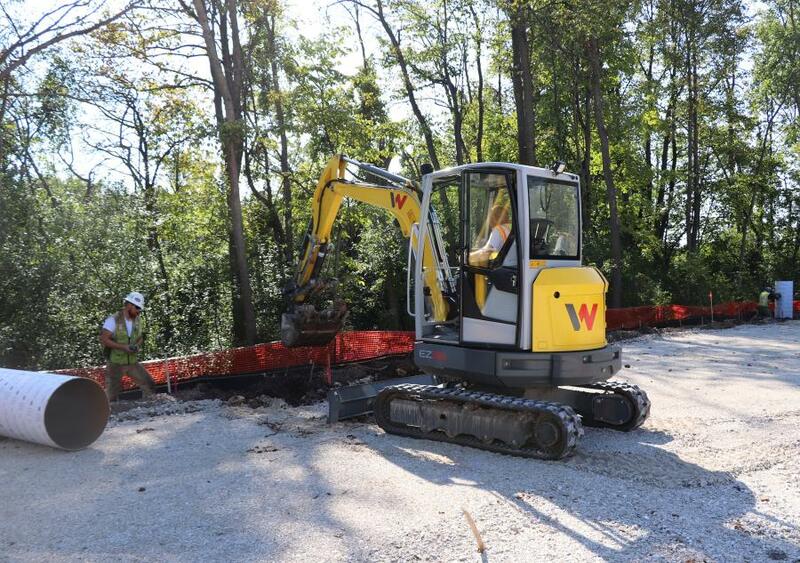 Wacker Neuson continues to optimize its excavator line with the addition of two models that are built for operator comfort, stability, power and serviceability. The 3.6-ton (3.1 t) EZ36 and 2.6-ton (2.3 t) EZ26 compact excavators with a minimal tail swing design are versatile machines for a variety of applications. 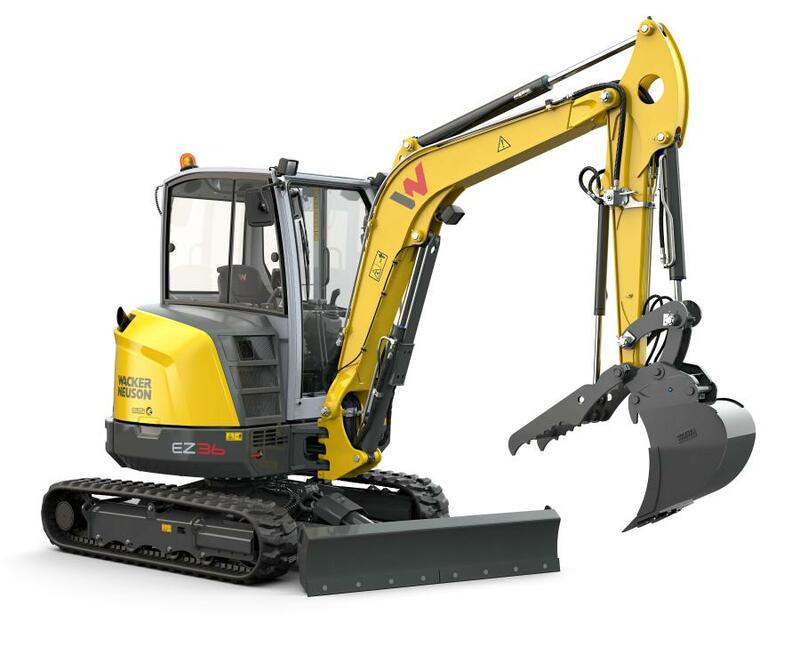 The 3.6-ton class excavator is among the most popular size in the market, so Wacker Neuson looked at features and benefits that would stand out in the crowded field. The EZ36 combines the technology and operator comfort of a larger machine in a powerful, yet economical package. With best-in-class dig depth (11 ft. 6 in. [3.5 m]) and reach (18 ft. 6 in. [5.6 m]), the EZ36 is highly productive and offers the performance of a conventional track loader with excellent maneuverability and stability on a minimal swing machine, according to the manufacturer. The user-friendly operating concept and comfortable cab starts with the ergonomic joystick, jog dial, key pad and 3.5-in. display all within easy reach and view. The large cab offers plenty of head and leg room, adjustable seat and armrests, plus creature comforts such as ample storage compartments, mobile phone cradle and USB port. The ISO/SAE control pattern change over switch is conveniently located in the cab, allowing operators to select their preferred pattern quickly. The air conditioning system keeps the operator cool all day and a unique four position adjustable windshield is ideal for ventilation and job site communication. The dual flange roller system on the undercarriage improves lateral stability while digging and loading as well as reduces noise and vibration while traveling. When it comes to power, the EZ36 combines the 24.5 hp Yanmar engine with a load sensing hydraulic system to optimize a powerful machine in the under 25 hp class. Add the optional power angle dozer blade with float function and the EZ36 is a real productive excavator on the job site. All the daily service checks are easy to see and reach with removable covers and the large hood. The tilting cab and removable ROPS make routine maintenance more convenient and less time consuming. The EZ26 also offers a modern design, comfortable cab with wide entry, ergonomic controls and quick, cost-saving maintenance access. The 2.6-ton unit is ideal for working in tight spaces and is a great choice for landscape and backyard projects. It's easy to transport with eight tie downs, six on the track and two on the dozer blade. Powered by a 20.4 hp Yanmar Tier IV Final engine, the EZ26 has a dig depth of 9 ft. (2.7 m) and maximum reach of 15 ft. 5 in. (4.7 m). Both the EZ36 and EZ26 are available with the Wacker Neuson's vertical digging system (VDS). VDS enables progressive tilting of the superstructure by up to 15 degrees to compensate for slopes, saving up to 25 percent on material and time costs, according to the manufacturer.